Spanish, Portuguese, and sometimes French parts of the Americas are called "Latin America"
Latin America is a region of the Americas. People do not completely agree which countries are in Latin America, but normally, it is the parts where Spanish and Portuguese are spoken (South America, Central America, and Mexico). Sometimes the Caribbean Islands are also included. Other people call all American countries where people speak Spanish, Portuguese, and French Latin America. The words Latin America come from the use of languages that came from Latin. 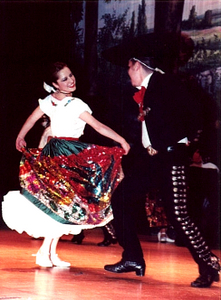 The Spanish, Portuguese, and French languages, spoken by many people in Latin America, are Romance languages. Romance languages are derived from Latin. Not all people in Latin America speak Romance languages, some Latin American people speak English like Guyana, Trinidad and Tobago or Belize. Suriname speaks Dutch and many countries have a large population that speaks Native American languages. Paraguay is the only country that has a native language as its official language, which is the Guarany language. Most Latin Americans are Roman Catholic. 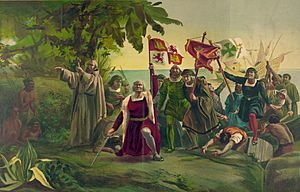 Romantic Painting of Christopher Columbus arriving to the Americas Primer desembarco de Cristóbal Colón en América, by Dióscoro Puebla 1862. With the arrival of the Europeans following Christopher Columbus' voyages, the indigenous elites, such as the Incas and Aztecs, lost power to the heavy European invasion. Hernándo Cortés seized the Aztec elite's power with the help of local groups who did not favor the Aztec elite, and Francisco Pizarro eliminated the Incan rule in Western South America. The European powers of Spain and Portugal colonized the region, which along with the rest of the uncolonized world, was divided into areas of Spanish and Portuguese control by the line of demarcation in 1494, which gave Spain all areas to the west, and Portugal all areas to the east (the Portuguese lands in South America subsequently becoming Brazil). By the end of the sixteenth century Spain and Portugal had been joined by others, including France, in occupying large areas of North, Central and South America, ultimately extending from Alaska to the southern tips of the Patagonia. 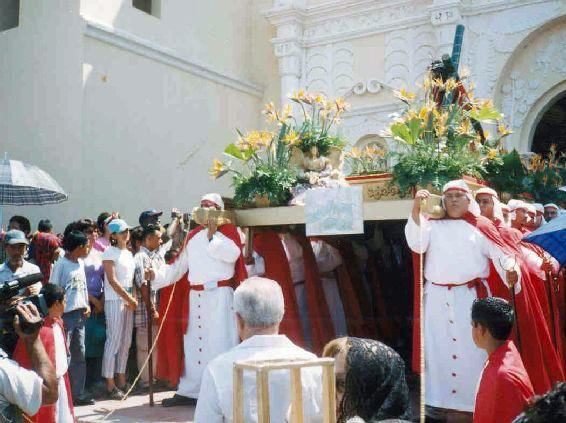 European culture, customs and government were introduced, with the Roman Catholic Church becoming the major economic and political power to overrule the traditional ways of the region, eventually becoming the only official religion of the Americas during this period. 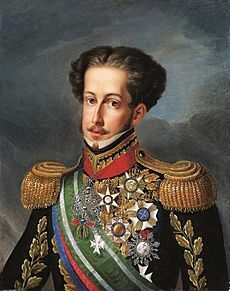 Pedro I, the emperor of Brazil. By the end of the eighteenth century, Spanish and Portuguese power waned on the global scene as other European powers took their place, notably Britain and France. Resentment grew among the majority of the population in Latin America over the restrictions imposed by the Spanish government, as well as the dominance of native Spaniards (Iberian-born Peninsulares) in the major social and political institutions. Napoleon's invasion of Spain in 1808 marked a turning point, compelling Criollo elites to form juntas that advocated independence. 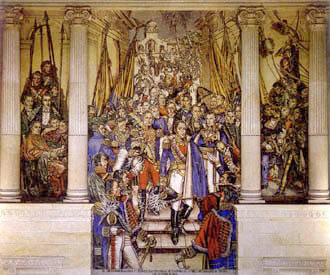 Also, the newly independent Haiti, the second oldest nation in the New World after the United States, further fueled the independence movement by inspiring the leaders of the movement, such as Miguel Hidalgo y Costilla of México, Simón Bolívar of Venezuela and José de San Martín of Argentina, and by providing them with considerable munitions and troops. 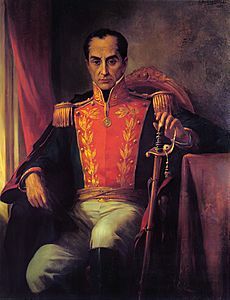 Brazil President, Getúlio Vargas, wanted to industrialize Brazil allowing it to be more competitive with other countries. He reached out to Germany, Italy, France, and the United States to act as trade allies. Many Italian and German people immigrated to Brazil many years before World War II began thus creating a Nazi influence. The immigrants held high positions in government and the armed forces. It was recently found that 9,000 war criminals escaped to South America, including Croats, Ukrainians, Russians and other western Europeans who aided the Nazi war machine. Most, perhaps as many as 5,000, went to Argentina; between 1,500 and 2,000 are thought to have made it to Brazil; around 500 to 1,000 to Chile; and the rest to Paraguay and Uruguay. It was not a secret that Vargas had an admiration for Hitler's Nazi Germany and its Führer. He even let German Luftwaffe build secret air forces around Brazil, but he knew that he could never favor the Nazis because of their racism towards the large black population in Brazil. This alliance with Germany became Brazil's second best trade alliance behind the United States. There was Nazi influence in certain parts of the country, but Jewish migration from Europe during the war continued. Only a small number of people recognized or knew about the Holocaust. Furthermore, numerous military bases were built during the war by the U.S, but some also by the Germans. Even now, unexploded bombs from the second world war that need to be made safe still remain. 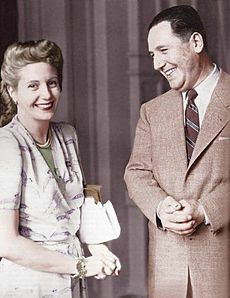 Argentine President, Juan Perón and his wife Evita, two of the most recognised figures in terms of populism in Latin América. Economic integration was called for, to attain economies that could compete with the economies of the U.S or Europe. Starting in the 1960s with the Latin American Free Trade Association and Central American Common Market, Latin American countries worked toward economic integration. After World War II and the beginning of a Cold War between the U.S. and the Soviet Union, U.S. diplomats became interested in Asia, Africa, and Latin America, and frequently waged proxy wars against the Soviet Union in these countries. The U.S. sought to stop the spread of communism. Latin Americans generally resented the U.S. superiority over them. Latin America also complained of the U.S. support to locals in overthrowing nationalist governments, and intervention through the CIA. Still, Latin America respected the U.S. during this time, and Latin American countries generally sided with the U.S., even though they complained of being neglected by the U.S.'s concern with communism in Europe and Asia, not Latin America. In 1947, the U.S. Congress passed the National Security Act, which created the National Security Council in response to the United States's growing obsession with anti-communism. In 1954, when Jacobo Arbenz of Guatemala accepted the support of communists and attacked holdings of the United Fruit Company, the U.S. decided to assist Guatemalan counterrevolutionaries in overthrowing Arbenz. These interventionist tactics featured use of the CIA rather than the military, which would be used in Latin America for the majority of the Cold War in events like the overthrow of Salvador Allende. Latin America was more concerned with issues of economic development, while the United States focused on fighting communism, even though the presence of communism was small in Latin America. By 1959, Cuba was afflicted with a corrupt dictatorship under Batista, and Fidel Castro ousted Batista that year and set up the first communist state in the hemisphere. The U.S. imposed a trade embargo on Cuba, and combined with Castro's expropriation of private enterprises, this was detrimental to the Cuban economy. Around Latin America, rural guerrilla conflict and urban terrorism increased, inspired by the Cuban example. 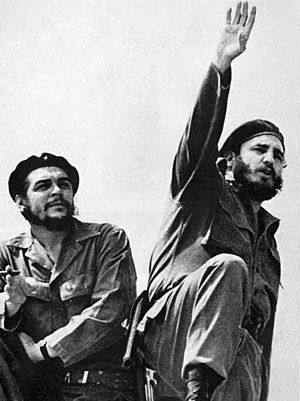 The United States put down these rebellions by supporting Latin American countries in their counter guerrilla operations through the Alliance for Progress launched by President John F. Kennedy. This thrust appeared to be successful. A Marxist, Salvador Allende, became president of Chile in 1970, but was overthrown three years later in a military coup. Despite civil war, high crime and political instability, most Latin American countries eventually adopted democracies besides Cuba. Encouraged by the Guatemala success, Kennedy, in 1960, decided to launch an attack on Cuba. The Bay of Pigs invasion was an abortive invasion of Cuba in 1961, financed by the U.S. through the CIA, to overthrow Castro. The incident proved to be very embarrassing for the new Kennedy administration. The Cuban Missile crisis nearly brought the U.S. and the Soviet Union to war in October 1962. Soviet premier Nikita Khrushchev had installed several missiles in Cuba that could hit most of the Eastern United States. President Kennedy decided to place a naval blockade on Cuba to prevent further Soviet shipments of missiles. In the end, Khrushchev submitted, taking missiles away. In return, Kennedy agreed never to invade Cuba, and to withdraw nuclear-arms from Turkey. 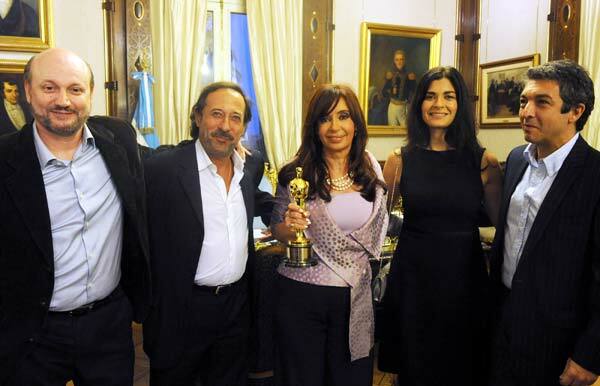 In recent years, several Latin American countries led by socialist or other left wing governments – including Argentina and Venezuela – have campaigned for (and to some degree adopted) policies contrary to the Washington Consensus set of policies. (Other Latin countries with governments of the left, including Brazil, Chile and Peru, have in practice adopted the bulk of the policies.) Also critical of the policies as actually promoted by the International Monetary Fund have been some U.S. economists, such as Joseph Stiglitz and Dani Rodrik, who have challenged what are sometimes described as the "fundamentalist" policies of the International Monetary Fund and the US Treasury for what Stiglitz calls a "one size fits all" treatment of individual economies. The population of Latin America comprises various ethnic groups and races, making this continent the most diverse in the world today. The majority of Latin Americans are Mestizo (European-Native American); while some are dominated by Native Americans, others are dominated by people from Europe; and some others are Mulatto, Black, Zambo, and Asian. European/Whites are the largest single ethnic group, they and people of part-European makeup about as much as 80% of the Latin American population, possibly even more. Native American. The Native population in Latin America, came during the Lithic stage. They number in more than sixty million (by some experts). They makeup the majority only in Bolivia, Peru, and Guatemala. In Ecuador the Indeginous population is a large minority of about 1/4 of the population. Mexico's pure to almost pure Native American population is nearly 30% (with 9.8% to 15% being of pure blood), and is also one of the largest Amerindian population in the Americas in terms of absolute numbers. Most of the remaining countries have Native American minorities. European. In the 1500s, large numbers of Iberian colonists came to what is now Latin America. Today, most White Latin Americans are of Spanish and Portuguese origin. 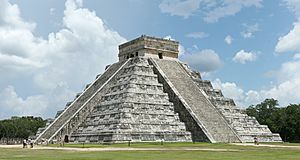 The Iberians brought their language, religion, and culture to Latin America. Brazil, Argentina, Mexico, and Colombia contains the largest numbers of Whites in Latin America. Whites makeup the majorities of Uruguay, Argentina, Costa Rica, Puerto Rico, and Chile. In Brazil, whites makeup over half of the population, 53.8%. Therefore with over 100 million people descendants of european whites, Brazil accounts for nearly two thirds of all the whites in the Latin America. The rest of the remaining countries have a White minority (small or large). African. Millions of African slaves were brought to the Americas from the early 1500s onward. The majority went to the Caribbean and Brazil. Among the Hispanic nations and Brazil, Dominican Republic is the only country in Latin America with a Black majority of about 80-90%. Significant populations include Cuba (35%), Puerto Rico (23%), Colombia (19%), and Venezuela (12%). The remaining countries have a Black minority (small or large), Panama has the largest Black population of Central America with about 14% of Panamanians being Black. Asian. People of Asian descent number several millions in Latin America. The majority of Asian Latin Americans are of Japanese and Chinese heritage, and they mostly live in Peru and Brazil. The largest community of Japanese ethnicity living outside of Japan, resides in Brazil. There is also a growing Chinese population in Panama, as well as Costa Rica (though, Chinese Costa Ricans are a large minority). In the Dominican Republic, there is a place where large numbers of Japanese people came; most Japanese Dominicans live in towns such as Bonao and Santo Domingo (though in the Capital's mostly comprised with Chinese people). 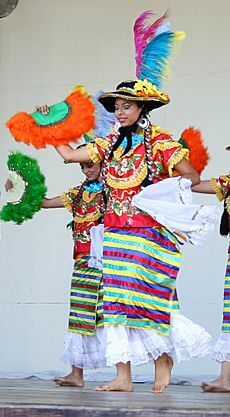 Asian Latin Americans are also found anywhere in the Caribbean and other Latin American countries. Arab or Middle Eastern. Arabs in Latin America are also many, but they are mostly found among the Hispanic-Caribbean regions. In Cuba and Puerto Rico, the Arab population are actually in-blood lines of the Canarians and Southern Spaniards that colonized them. In the Dominican Republic, the Arabs arrived sometime between the 19th and 20th century; they makeup about 5% of Dominicans (most are Morracians, Lebanese and East Indians). Arabs are also many in Peru and Venezuela. NOTE: Most of these ethnic groups can be found anywhere in Latin America; but since most Latin Americans are of mixed-race, many of these ethnic groups do not reach 100%. The bottom chart is an accurate estimate, since all of these countries were tested for DNA genetics among the local people who have more than 3 generations in their home country of origin since the year 2000. So regardless of age, anyone who was born before or after will be tested, but will only count with their ancestors for 3 generations before the year 2000. Note: Puerto Rico is a territory of the United States. Spanish and Portuguese are the dominant languages of Latin America. Portuguese dominates Brazil. Spanish is the official language of most other Latin America mainland countries, and of Cuba, Puerto Rico (along with English), and the Dominican Republic. 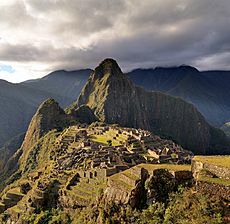 Native American languages are widely spoken in Peru, Guatemala, Bolivia, Paraguay and Mexico. They are less used in other countries. Other European languages spoken in Latin America include English (mainly in Puerto Rico}, and French. African languages are also spoken by few in Latin America. The west African Yoruba language (known as Lucumi) is spoken among the people of predominant Yoruba ancestry; it is spoken in Cuba where it is a ritual language used by the Santeria prayers. In several nations, Creole languages are also spoken, especially in the Caribbean. Palenquero is the Spanish-based Creole language spoken in Colombia by some 3,000 people, it is Spanish with many African influences and some Portuguese influence. Other creoles in mainland Latin America have the same roots, blending Spanish with either African or Indigenous languages or both, as Cuban Spanish does. According to some analysis, by 2050 the biggest economies in the world will be China (1), United States (2), India (3), Brazil (4), and Mexico (5). Income from tourism is key to the economy of several Latin American countries. 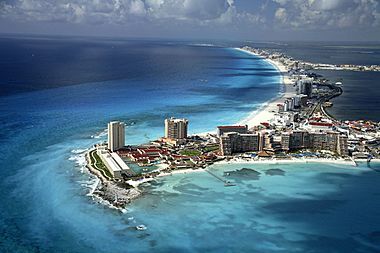 Mexico is the only Latin American country to be ranked in the top 10 worldwide in the number of tourist visits. It received by far the largest number of international tourists, with 35.1 million visitors in 2016, followed by Brazil, with 6.6 million; the Dominican Republic, with 6 million; Chile, with 5.6 million; Argentina, with 5.5 million; Cuba with 4 million; Puerto Rico with 3.7 million; Peru with 3.7 million; and Colombia, with 3.3 million. The World Tourism Organization reports the following destinations as the top six tourism earners for the year 2016: Mexico, with US$19,571 million; the Dominican Republic, with US$6,723 million; Brazil, with US$6,024 million; Colombia, with US$4,773 million; Argentina, with US$4,687 million; and Panama, with US$4,258 million. 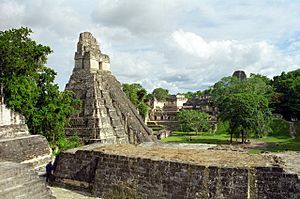 Places such as Cancún, Riviera Maya, Galápagos Islands, Punta Cana, Chichen Itza, Cartagena de Indias, Cabo San Lucas, Mexico City, Machu Picchu, Margarita Island, Acapulco, San Ignacio Miní, Santo Domingo, Buenos Aires, Salar de Uyuni, Rio de Janeiro, Punta del Este, Labadee, San Juan, São Paulo, La Habana, Panama City, Iguazú Falls, Puerto Vallarta, Poás Volcano National Park, Viña del Mar, Guanajuato City, Bogotá, Santa Marta, San Andrés, San Miguel de Allende, Lima, Guadalajara, Cuzco, Ponce and Perito Moreno Glacier are popular among international visitors in the region. Poverty continues to be one of the biggest challenges for Latin American countries. 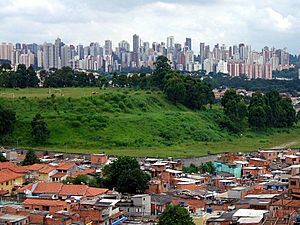 According to estimates, Latin America is the most unequal regions of the world. According to a Country Studies Institute the poorest countries in the region (in 2011) were: Haiti, Dominican Republic, Nicaragua, Bolivia and Honduras. Undernourishment affects 72% of Haitians, 47% of Nicaraguans and Bolivians, 32% of Hondurans and 27% of Dominicans. Populations of below the poverty line; according to a Country Studies Institute, poverty affects over 90% of Haitians, 75% of Bolivians, 70% of Nicaraguans, 63% of Hondurans and 54% of Dominicans. Latin America Facts for Kids. Kiddle Encyclopedia.